Transportation Costs > How Much Does a Gyrocopter Cost? How Much Does a Gyrocopter Cost? ­The gyrocopter, or more formally known as the gyroplane, rotorcraft, or autogyro, is a type of rotorcraft usually built from a kit or from plans. It utilizes unpowered rotor blades that turn at several hundred RPM to produce a lift that can sustain flight. It also has an engine-driven propeller that moves the gyroplane forward. 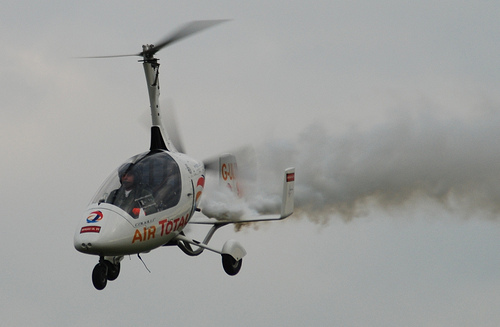 Gyrocopters can be used to fly for fun, as an agricultural device (crop spray) or as a means to travel. While the gyrocopter can be mistaken for a helicopter if seen from far away, these two aircraft work in very different ways. With a helicopter, an engine causes the blades to spin and create the lift. With a gyrocopter, the engine propels the craft forward, and the air flow created by this movement forces the blades to spin and create lift. The good part about this is that even if the engine fails, the blades will continue to rotate because of momentum, and the craft will slowly descend for a safe landing. The cost of gyrocopters depends on the manufacturer, the design, features, brand and where it’s purchased from. The costs can range from as little as $25,000 to more than $150,000. At Barnstormers.com, gyrocopters for sale by owners cost anywhere from $9,000 for a Dominator-style gyrocopter to as high as $125,000 for a 2012 Auto Gyro Cavalon, according to the classified ads active at the time of this writing. According to the PRA.org, gyroplanes can be built from plans for less than $10,000 and about twice as much for single-place gyroplane kits. Gyroplanes are usually built from kits, plans, or original designs. Many of the gyroplane kits come with seamless aluminum tubing as well as aluminum plates and fittings which are connected using aircraft-grade nuts, bolts and washers. Installation does not require welding. In the United States, gyroplanes are built directly from kits or plans and no companies produce ready-to-fly gyroplanes that are licensed to fly within the United States. A single-seat is typically around 14 feet long and weighs around 500 pounds empty. Most cruise at 45 to 60 mph. A quick build kit will usually comprise of standard and optional equipment. Standard equipment may include the following: all airframe components, control assembly, fuel pumps, an engine, electrical switches and breakers, fuel injection, integrated electronic flight information system, propeller, rotor blades, rotor brake assembly, rotor tachometer, a factory pre-built tail, and a throttle lock assembly. Optional equipment may include cabin doors with hardware, heater, and an oil cooler set. Time to build can range from 80 hours to 1,000 hours, depending on the specific make and model of the gyroplane. Complete gyroplane flight training is required to get an FAA gyroplane rating. Also, many gyroplane dealers require interested buyers to complete proper training from an approved facility before they can buy any gyroplane. Gyroplane flight training can cost about $1,500 to $3,000, depending on the class in which the student enrolls. Individuals with no flying experience will need an average training period of 30 hours. Licensed pilots looking to convert will need to spend approximately 10 hours. At some schools, gyroplane training starts at $180 per hour with discounts provided to those who purchase hours in bulk. Maintenance and operation of the gyroplane are a given. Some models may set users back about $500 for maintenance services needed after a specific number of hours. If you are going to build your own gyrocopter, you may want to personalize it as well. There are certain decals and designs that you can get for the body of the aircraft in the same way that you can get decals made for your car. These will cost extra, but it can add a great dynamic to your gyrocopter. A pilot’s license is often required if the aircraft weighs less than 254 pounds. If it weighs more than that, a student’s pilot license is necessary. Some gyrocopter manufacturers offer a stability augmentation kit that gives customers the alternative to enhance their gyro from being a single-bearing rotor head to a double-bearing unit. Newer gyroplane models are equipped with safer aerodynamic stability designs and are less sensitive to turbulence compared to airplanes and helicopters. When it comes to life expectancy, a gyrocopter has a practically unlimited lifespan. Depending on the manufacturer, the rotor, engine and propeller will have a varied lifespan. Generally, the time between overhauls for engines typically varies between 1,000 and 2,000 hours. Check for discounts offered for gyroplane flight training if you were to need it. Most schools offer discounted rates to those who purchase flight training hours in bulk. Collect a list of the models and prices offered for gyrocopter kits. With the help of an instructor, choose a kit that best suits your budget and your skills. Building the kit yourself will be cheaper than purchasing one that is already built. Purchasing a used model will be the cheapest option.